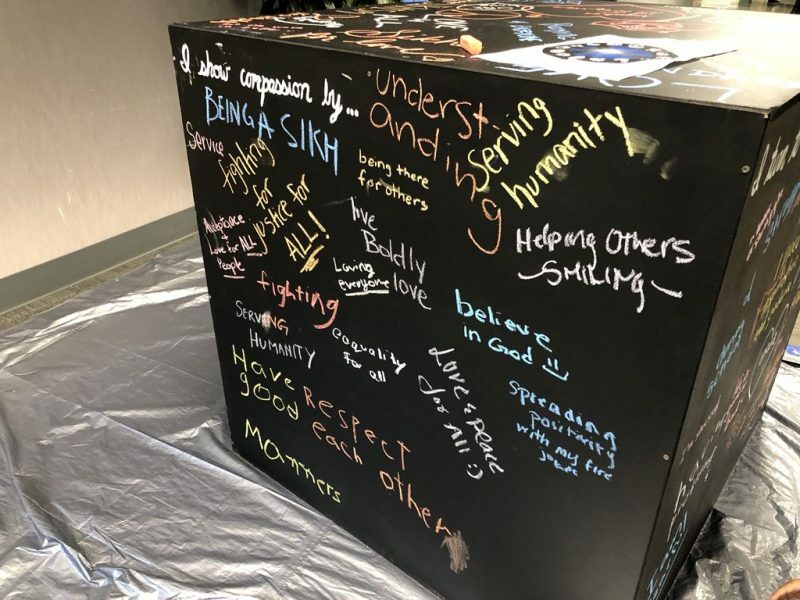 Attendees at the inaugural Festival of Faiths wrote how they show compassion. More than 1,500 people of diverse faiths came together for the event. There is power in community. That power is felt in a room of 1,500 people of different faiths, creeds, backgrounds, and ethnicities coming together despite differences. That power is felt when spiritual leaders sit in a circle and share prayers that somehow, even in disagreement, can be meaningful for all. That power is felt when two people who come from different places and spaces are able to share in a conversation. The Festival of Faiths, organized by the Bridges of Faith Trialogue and held on June 24 at the Cintas Center, highlighted the power of the Cincinnati faith community. It is often all too easy to sit in our silos and close ourselves off from those around us; it is comfortable to be in places with which we are familiar. This community, however, is committed to the goals of diversity, dialogue, and inclusion. The theme of the day, “Compassion through Action” showed that the Cincinnati faith community, in all of its many forms, will work to create a world in which we all have the space to believe in our myriad of ways, while working together towards a common good. In addition to both moments of prayer and celebration, the festival also included moments of reflection and introspection. The JCRC’s Associate Director Justin Kirschner had the opportunity to facilitate one of the dialogue sessions of the day. He facilitated a compassionate conversation on how communities can show up and act on the topics of racism and discrimination. In presenting these key ideas, he heard back that there is a strong desire in our community to be connected with those different from ourselves. We must recognize, he says, the “importance of understanding each other’s personal stories and backgrounds.” Justin’s session highlighted the power of the day: that when we can all come together and meet each other as people, we build connections and make positive change in our community. Power resides in our community because we create communities that reflect our values. In sharing a teaching from Jewish tradition in the opening, interfaith prayer circle, Rabbi George Barnard shared the Talmudic passage (Shabbat 133b), “Be like God. Just as God is merciful and gracious, so you should be merciful and gracious.” This teaching acted like an echo as only moments before, Vijay Doshi shared the Micchami Dukkadam, the Jain prayer for forgiveness. The community joined together in saying, “My friendship is with all living beings.” When we meet each other with faith, mercy, and grace, we are able to connect to our fellow human, extending friendship throughout all of our community. The JCRC is proud and honored to have been even a small part of the Festival of Faiths. This event reinforces our ideals of community, inclusion, and justice for all through mutual understanding and respect. As we continue the work of building our community and pushing ourselves to connect with those with whom we find differences, we can always remember the message that in everything we do, we must act with compassion. Follow the JCRC on Facebook and Twitter. The Jewish Community Relations Council is one of more than fifty programs and agencies funded by the Jewish Federation of Cincinnati. Thanks to you, the JCRC is protecting Jewish security, recognizing that Jewish security depends on a just society for all. Thank you for commenting about The Festival of Faiths in June. It was truly an amazing event. I was disappointed that Bridges of Faith Trialogue was not mentioned as they were the primary reason Festival of Faiths took place.